On the corner of North Evergreen Street and Peach Avenue, amidst the beautiful homes of the Evergreen Historic District of Memphis, Tennessee, sits an empty, overgrown lot. This 10 by 20 foot vacant parcel is a battle scar left from the famous I-40 case. For those unfamiliar with the history, the interstate was scheduled to cut through the neighborhood, taking down hundreds of homes in preparation. At the time, a group of neighbors went to the Supreme Court and became the first and only community group to block a part of an interstate’s creation. Since 1991 when the city of Memphis bought back the land from the state, houses have been built on most of the area previously designated for the interstate. But, at the corner of North Evergreen and Peach sits a reminder of this spirit of activism and sense of responsibility for the wellbeing of the neighborhood. Unfortunately, this reminder is subject to frequent flooding. This is the motivation behind the Evergreen Raingarden Association. This community association of neighbors is working to transform the lot into “N.E.S.T. at Peach”, a special type of garden, known as a rain garden, that will capture storm water runoff from the area’s impervious surfaces and use it to beautify the neighborhood by cultivating a plot of diverse plants and vegetation. There are many areas in Memphis that are prone to flooding because of the city’s heavy rainfall and proximity to tremendous water resources, like the Mississippi River. In 2010, the EPA issued a consent order to push the city to improve some of its rain water management infrastructure. But, like many urban areas, Memphis has a significant demand for urban capital expenditures and infrastructure maintenance, which makes it difficult to consider new, creative ways to improve existing water management systems. Robyn Mace, one of the project partners working on the creation of “N.E.S.T. at Peach” explained that residential rain detention and capture can make a huge difference in terms of the volume of storm water that goes into the sewer system. A huge part of this process is educating people about how these types of low impact development projects actually work. 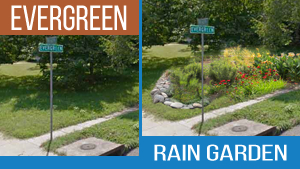 Rain gardens are bowl-shaped depressions that are designed to hold overflow water for twenty-four to thirty-six hours by slowing its percolation down into the soil. The rain garden’s designers place a variety of vegetative species where they will be most effective in the garden; lower, middle, and upper plants are positioned depending on their tolerance to large amounts of water. The garden at North Evergreen and Peach is unique. Its location atop an aqueduct that is part of the city’s water management system makes it the perfect site to observe the contrast between existing hard infrastructure, a concrete channeled stream, and the possibilities provided by a beautiful flower garden. “It’s an opportunity to let people know about the city’s stormwater management system [and provide] a link between the watersheds we live in as well as the city that we live in and the infrastructure that supports our lifestyle,” says Mace. Robyn and the other members of the Evergreen Raingarden Association are well on their way to making this type of large-scale impact possible. The community group is planning the garden’s construction through a three-phase plan for the lot, beginning with a demonstration garden as a way to begin a conversation with the city and other neighborhood associations about using low impact development techniques in other areas of flooding. The second phase will focus more on how to use these techniques in both the design process for the garden, as well as for surrounding infrastructure improvements, like sidewalk reconstruction. The final stage will be the actual construction of the garden and embellishing it with educational signage about the nearby watersheds and the storm water management processes. Neighborhood volunteers who have been going door to door to gather support have already been recruited to help with planting and maintenance, further establishing the project as something of community wide importance. Through the creation of the garden, Robyn explains, “We can help contribute to a dialogue about managing our collective resources.” They can continue to do so with your support.